I went to a wedding when I was 8 1/2 months pregnant with my first child. There were 2 bowls of punch and since I wasn’t sure which if any, had alcohol, I asked the serving staff. He directed me to the non alcoholic punch. When I was pregnant I did not drink. Even though I was assured over and over again, “oh you can just have a little to taste – it won’t bother the baby.” Still, I just preferred to abstain. However, I was pretty darn sure that waiter made a mistake. But I was pregnant, so I figured that maybe my taste buds were off, as pregnancy does weird stuff to a person, like making them severely crave black olives and feta cheese, as well as Boston cream donuts; at the same time. So I had a little more punch to be sure. And it still tasted like alcohol. Believe me, I was familiar enough with booze by this point in my life that, pregnant brain or not, I’d know if I was drinking it. But for some reason, I also trusted that the server wouldn’t send a very pregnant lady to the spiked punch. Don’t get my wrong, I enjoy alcohol (especially wine) but just not while another human is growing inside me and relying on me for brain development and important stuff like that. This is not about being judgy. Pregnancy is right around the time I discovered this punch. But since I couldn’t remember what was in the one I’d had all those years before when I had pregnant brain, I created this one. But what I did recall was the frozen strawberries because they were awesome AND they do double duty as ice cubes! I’m sure I’m pretty close to the original because this punch is so good! Seriously… this punch is soo good that you don’t even miss the alcohol. It’s got this champagne-like bubbly and fizzy thing happening and it’s the perfect punch recipe for kids. It’s also the ultimate party punch! I serve it at all my kids’ birthday parties and family BBQ’s. And, although it’s non alcoholic, it’s totally spikeable, if you so desire. But I’m more of a wine gal, so I’m perfectly happy to drink this punch sans alcohol (in between glasses of wine)! And if you have leftover punch, make popsicles! 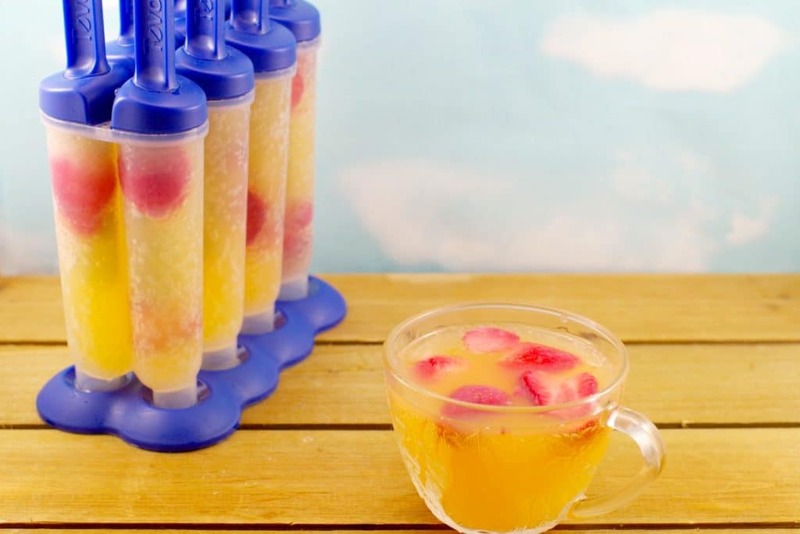 This punch makes the most excellent homemade ice pops! I’m all about reinventing leftovers so I made ice pops with my leftover punch and they were super yummy! I don’t like waste and if you feel the same, follow my Leftovers Reinvented Board on Pinterest for more great leftover ideas. Yeah. So “oops…” I found out that the waiter did make a mistake and directed me to the wrong punch. And I was not very happy about that! But people make mistakes. Plus, it’s not like drinking during pregnancy was a regular thing. No damage done. But it’s just annoying when it’s not your choice. So, if you have a pregnant lady in your life, need a baby shower punch or you’re just looking for punch recipes with gingerale, look no further. And since punch is just one of my those drinks you need in your life because what other drink do you get to scoop out of a giant bowl? Then you’ll LOVE this one! And while you are looking for non-alcoholic punch recipes to feed your crowd, you’re probably in need of food as well. 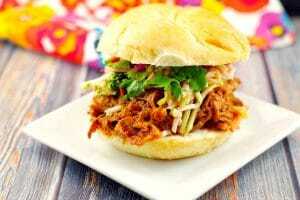 Why not give these slow cooker recipes a try? They are perfect easy summer entertaining or potluck recipes! And don’t forget dessert- No Bake Black Forest Tiramisu! 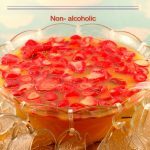 This simple non- alcoholic punch recipe with Gingerale and frozen strawberries is easy, quick, only 4 ingredients. 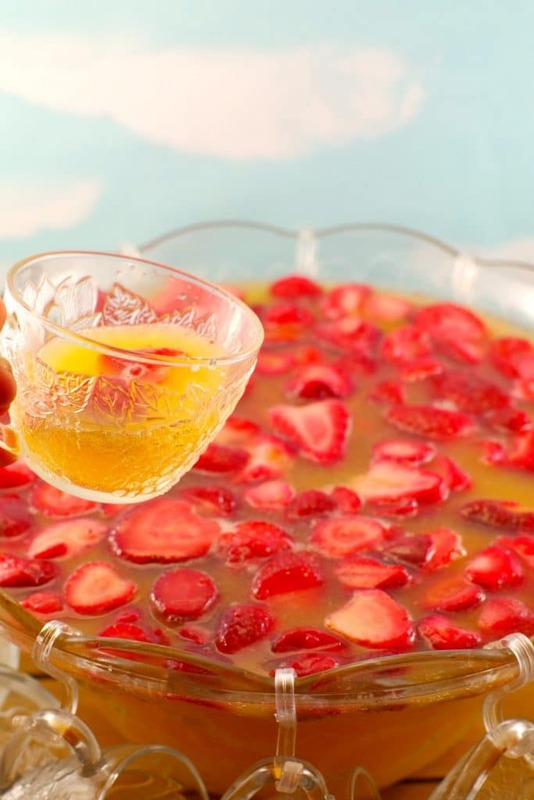 It's a kid friendly punch recipe that is perfect for family BBQ's, baby showers and birthday parties and loved by children and adults alike! 1 Weight Watchers Freestyle Smart point per serving! 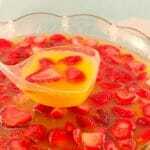 Mix all ingredients together in a large punch bowl or pitcher. Add strawberries last (as they serve as the ice) and serve. This recipe is part of the The Country Cook’s Weekend Potluck! You had me at sparkling & strawberry! 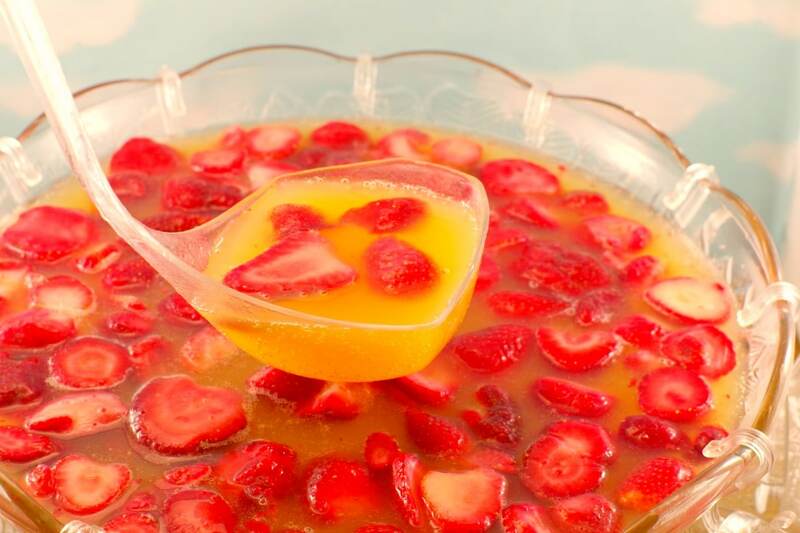 This really is the perfect party punch, and I also love that you made popsickles with the leftovers. I’m having a dry month so i love the idea of still being able to have a summer punch without the booze. Good for you, Ayngelina! Yes, it’s perfect for that! I know four little kids who would LOVE this punch! Pinning! 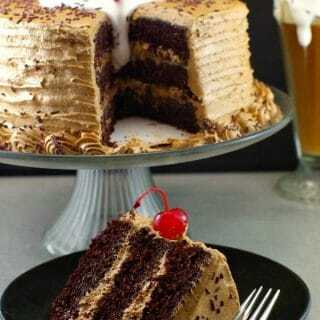 This is a keeper for birthday parties and other celebrations. Thanks for sharing, Terri!